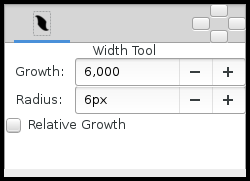 The Width Tool is designed for increasing or decreasing the width of a line much like you would with a pencil on paper. To change the width on a particular segment of a line, just select the Outline Layer you want, move your mouse over that line, press the left mouse button and move cursor back and forth along the line, like you're scratching something. The width of outline will be increased at the places where you moved the cursor. If you want to decrease the width, just hold Ctrl while scratching. The Width Tool was primarily designed for the "tablet" workflow, so you will get the best experience by using it with the tablet stylus. It is similar to making line thicker with a pencil or thinner with an eraser (when holding the Ctrl). to use the Transform Tool to directly manipulate the width handles. If you don't want the "Width Handle"s to be displayed, while using the Width Tool, just turn them off by pressing Alt5. You can turn them on again with the same keybinding. This page was last modified on 7 March 2016, at 19:44.